Every child seems to love balloons, I know that I did as a child and that all three of my own children love nothing better then playing with balloons. However, as a mum, I always worry that the balloon will pop in their face and scare them, or that it will burst and my toddler or baby will put it in their mouth and choke on it. As I am such a worrier I rarely let my children play with balloons in case my fears came true, I know I am such a killjoy at times. 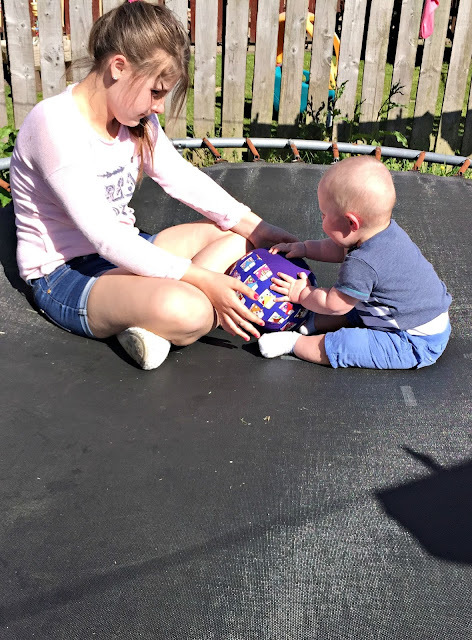 So when I heard about Bubabloon, a fabric sensory balloon cover I was very intrigued as this sounded like the perfect solution to balloon time fun for young children. Bubabloon is a clever little invention that is a fabric cover for balloons which protects little ones from choking or having a balloon pop in their face whilst still enabling the balloon to be light and bouncy and be played with the same way a regular balloon would be played with. We received a Hippy Chick purple balloon cover and a pack of balloons and we could not wait to try it out. The Bubabloon comes in a small drawstring bag which is perfect for storing and is very portable making it great for taken on days out. It is so simple to use you simply take a normal regular balloon and place it in the small gap in the cover and then blow the balloon up as normal and it inflates in the cover. You then tie a knot in the balloon and push the end into the gap and it will be covered by the special opening, making the balloon completely covered and safer for little ones. Even with the cover on the balloon was still very light and lots of fun to play with, all three of my children love it and have had great fun batting it, kicking it and thrown it around. I have even been able to let them play with it indoors, which I would be unable to do with a regular ball as I would be worried in case they knocked something over or hit each other. But as balloons are so light it does not matter as they will not hurt each other. We have had hours of fun with the Bubabloon and have found that it has lasted a lot longer then a regular balloon would and even though it has been kicked and thrown around by three children it has not popped. The cover can even be washed if it gets dirty, it is such a brilliant invention that is perfect for keeping little ones entertained during the summer. You can buy your own Bubabloon from www.bubabloon.co.uk where there is a wide selection of designs to choose from. Prices start from just £10.99 and you can purchase a pack of five balloons to go with it for just 99 pence. * Disclosure: We received a Bubabloon cover and pack of balloons free of charge for the purpose of this review, however all opinions are my own honest account of the product we received. This is such a simple but clever invention!